God says that we need to develop humility if we want the rewards of riches and honour and life (Proverbs 22:4). Humility brings many blessings. On the other hand, pride brings calamity. We've all struggled with some form of pride at some point. 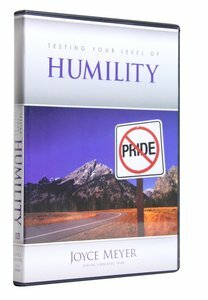 In this DVD, Joyce helps us identify our own level of humility and shares the steps we can take to eliminate pride from our life. Pride comes before a fall. But the good news is that we can keep ourselves from falling by taking hold of humility. As you allow God to deal with the areas of pride in your life, you will unlock the door to a deeper dimension of His power and love! About "Testing Your Level of Humility (60 Minutes)"